Combat the distractions that zap your focus and energy. If you'd like to manage distractions better and achieve more balance in your life, there is a DEFEATING THE DEMONS product to match your goals, time, and budget. 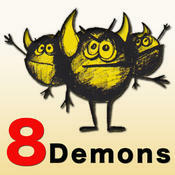 This App is designed to arm workforce employees, independent professionals and family managers with simple yet powerful strategies to defeat the 8 Demons of Distraction. Anyone dealing with stress, rushing, over commitment, new technology, and/or special life circumstances can use this book to reduce everyday distractions and needless mistakes. Readers find an in-depth description of each Demon, its sources and its insidious effects on attention span, concentration, performance, productivity, and work/life satisfaction. Practical, step by step strategies will help you rid your life of formidable enemies such as the Unruly Mind Demon, the Technology Demon, the Activities Demon, and five others. This book supplies a research-based, proven plan of attack to increase your daily effectiveness and decrease stress at home and on the job. Abstract: Here's a practical guide to ban work/life distractions, increase productivity and reduce stress. Whether you're a businessperson, community leader, parent or retiree, you can adapt an active role in enhancing your performance and quality of life--distraction free! Discover the root causes of your distractions, develop a 5-step plan and adapt strategies to move from good intention to positive action. Print: $18.95, Download: $15.00. Abstract: Happiness is a basic human desire and one of the founding principles of the United States. Yet, it is something many find elusive. What fundamental truths will make us happy, even in turbulent times? In "Finding Happiness with Aristotle as Your Guide: Action Strategies Based on 10 Timeless Ideas" you discover how to deal with the problems of today and get back on the path to happiness. Print: $15.95. Get the Mem-Cards deck entitled, Defeating the Demons of Distraction to access a hands-on, personal coaching tool that provides key ideas extracted from "Defeating the Demons." $9.95. These products make ideal gifts for family and friends, or business associates such as clients or vendors. They can be used at in-service training sessions, workshops, or conferences. Coffee mugs won't change lives, but these products may! Substantial discounts for large orders.